This information may be outdated, so please use caution when referencing these metadata. If you are associated with this project and capable of providing updates, please send us an email. The utility PowerBuoy PB40 was a prototype with unique, direct-drive Power Take-Off system. Compact and modular in design, the PowerBuoy was less than 12 feet in diameter and 55 feet long. It was based on OPT's proprietary design which is primarily below the sea surface when deployed, with minimal visual impact. Located in 30 m water depth in Kaneohe Bay, Oahu, Hawaii. OPT has been collecting data since the first OPT unit was deployed in June 2004 and has completed an extensive EA. This congressionally funded project, managed by Naval Facilities Engineering Command (NAVFAC), was intended to demonstrate the feasibility of wave power for naval facilities worldwide. The Buoy was installed in 2009, connected to the grid in September 2010, and decommissioned in 2011. The OPT wave power project at Oahu underwent an extensive environmental assessment by an independent environmental firm in accordance with the National Environment Policy Act (NEPA). This study featured evaluation of potential impacts on: the seabed, fish and benthic organisms, mammals, vegetation, and water quality, all within the sensitive ecosystems of Oahu. The project study resulted in a Finding Of No Significant Impact (FONSI), which is the highest environmental rating. The results of this study are included in a Report to Congress prepared by the US Department of Energy, titled “Potential Environmental Effects of Marine and Hydrokinetic Technologies”. 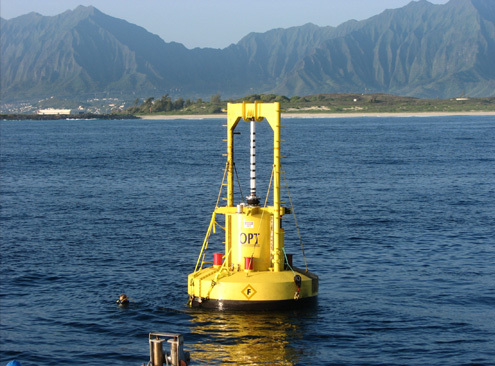 Kaneohe Bay OPT Wave Project is located in United States of America. Studies prior to deployment, conducted by an independent environmental firm. Underwater site assessment and desk studies. No turtles were seen during the assessment, but prior studies showed their presence. Humpback whales have been observed in waters as shallow as 15 ft from November through April. Tail slapping, breaching, and pods are routinely observed – as many as 15 individuals as one time. An average of three sightings a year occurs on the shoreline and in nearshore waters. None were observed during underwater assessment. Fish such as ono or wahoo (Acanthocybium solandri), aku or skipjack tuna (Katsuwonus pelamis), and moano ukali-ulua or goat fish (Parupeneus cyclostomus) typically occur along the 100-ft depth contour in the project area. For this reason, commercial, limited subsistence, and recreational fishing is conducted near the project area at this depth. The bottom conditions at the proposed project site do not offer unique habitat for species occurring in the area, and the site is not considered highly productive for spear fishing or uniquely attractive for SCUBA diving. Recreational activities in the vicinity of the project area include beachcombing, boating, bodysurfing, bottom fishing, jet skiing, kayaking, outrigger canoe paddling, sailing, trolling, surfing, swimming, sunbathing, pole fishing, thrownet fishing, spear fishing, and SCUBA diving. US Department of the Navy. (2003). Kaneohe Bay OPT Environmental Assessment. (pp. 300).